Manage and play your Kazaa downloads with this fully integrated media center. It supports file types (MP3, OGG, WMA, WMF, WAV, MPG, MPEG, MOV, AVI, DIVX, XVID, ASF, JPG, ...). Kazaa Media Center is the ideal companion for the popular Kazaa file sharing program. All files downloaded with Kazaa are instantly detected and imported in the media view where they can be browsed and managed by media type (audio, video, images, documents and software). Thanks to the built-in theatre you can play your audio and video files either in windowed or full screen mode and with the media details editor you can easily change the information for each file. 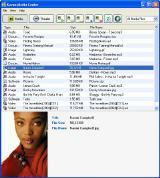 You can use Kazaa Media Center when Kazaa is either online or offline. Kazaa Media Center supports all major file types (MP3, OGG, WMA, WMF, WAV, MPG, MPEG, MOV, AVI, DIVX, XVID, ASF, JPG, GIF, PNG, BMP, RM, DOC, TXT, ...). Kazaa Media Center is the ideal companion for the popular Kazaa file sharing program. All files downloaded with Kazaa are instantly detected and imported in the media view where they can be browsed and managed by media type (audio, video, images, documents and software).